This delectable concotion can be a vegetarian entree or a tasty side casserole. I served it to guests recently. My friend Lynne called it “ambrosia.” Recipe serves 4 to 6. 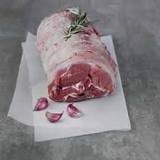 Preheat oven to 325 F. Spray an oven-proof casserole dish with non-stick coating. 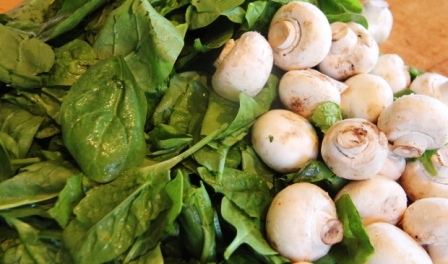 Place spinach with water in a samll saucepan. Bring to boil. Cook 5 minutes. Transfer spinach to a sieve and press out excess liquid with the back of a long-handled mixing spoon. Retun to pan. Stir in garlic powder or minced garlic, salt, pepper, cayenne and nutmeg into drained spinach. Mix well. In a skillet, melt butter over medium heat and saute mushrooms and onion until tender. Place cream cheese and the mushroom mixture in an even layer over the bottom of the prepared casserole dish. 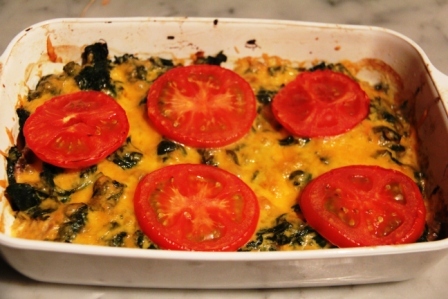 Top with an even layer of the seasoned spinach and sprinkle with grated cheddar. Top with tomato slices. Bake for 20 minutes or until throughly heated. Looks yummy, will definitely try this. MIght be moving soon as there is a decent offer on the house. Will keep you posted, When is your surgery? Good luck on the house, Bev. You’ll like the casserole. Surgery May 14 — I’ll be happy when it’s behind me.